Antimony (Sb) is a harmful element, and Sb pollution is one of the typical environmental issues in China, meaning that understanding of the geochemical behaviors of Sb is the key to control the fate of environmental Sb pollution. Sb tends to migrate in soluble form in the water–sediment system, but the fate of dissolved Sb is poorly known. Duliujiang river basin, located in southwest China, provided us with a natural aqueous environment to study the transport of Sb because of its unique geological and geographical characteristics. Physicochemical properties (pH, EC, Eh, DO, Flux), trace elements (Sb, As, Sr) and main ions (Ca2+, Mg2+, SO42−) concentrations in mining-impacted waters were measured in order to determine their distribution and migration potential. There are three types of water samples; they are main stream waters (pH of 7.33–8.43), tributary waters (pH of 6.85–9.12) and adit waters with pH values ranging from 7.57 to 9.76, respectively. Results showed that adit waters contained elevated concentrations of Sb reaching up to 13350 µg L−1 from the abandoned Sb mines, and mine wastes contained up to 8792 mg kg−1 Sb from the historical mine dumps are the important sources of Sb pollution in the Duliujiang river basin. Dissolved Sb had strong migration ability in streams, while its attenuation mainly depended on the dilution of tributary water with large flow rate. In the exit section of the Duliujiang river basin, which had only 10 µg L−1 of average Sb concentration. The simple deionized water extraction was designed to investigate the ability of Sb likely to dissolve from the mine wastes. 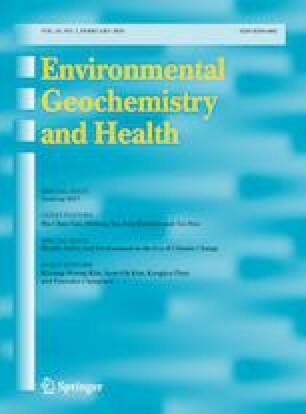 The results indicated that a greater solubility of Sb in alkaline (pH of 7.11–8.16) than in acid (pH of 3.03–4.45) mine wastes, suggesting that mine wastes contained high Sb concentrations, could release Sb into solution in the natural river waters. Furthermore, the fate of Sb pollution depends on the comprehensive treatment of abandoned adit waters and mine wastes in the upper reaches of the drainage basin. The online version of this article ( https://doi.org/10.1007/s10653-019-00285-8) contains supplementary material, which is available to authorized users. This work was supported by the National Natural Science Foundation of China (Nos. U1612442, 41401568) and the Project of Science and Technology Department of Guizhou Province (RENCAI5664; ZHICHENG2835). The authors would like to acknowledge the Environmental Protection Bureau of Qiannan and the Environmental Protection Bureau of Qiandongnan, Guizhou Province, for the routine monitoring data of cross section provided to this paper. U.S. Geological Survey (USGS). (2018). Mineral Commodity Summaries. Antimony. Statistics and Information. https://minerals.usgs.gov/minerals/pubs/commodity/antimony/mcs-2018-antim.pdf. Accessed Jan 2018.